Be the boss of your own knitting. That’s a phrase Elizabeth Zimmerman used a lot, but today was the first time I actually got it, what the phrase means. You see, I always felt like I had to apologise for liking vanilla socks instead of complicated looking lace ones. 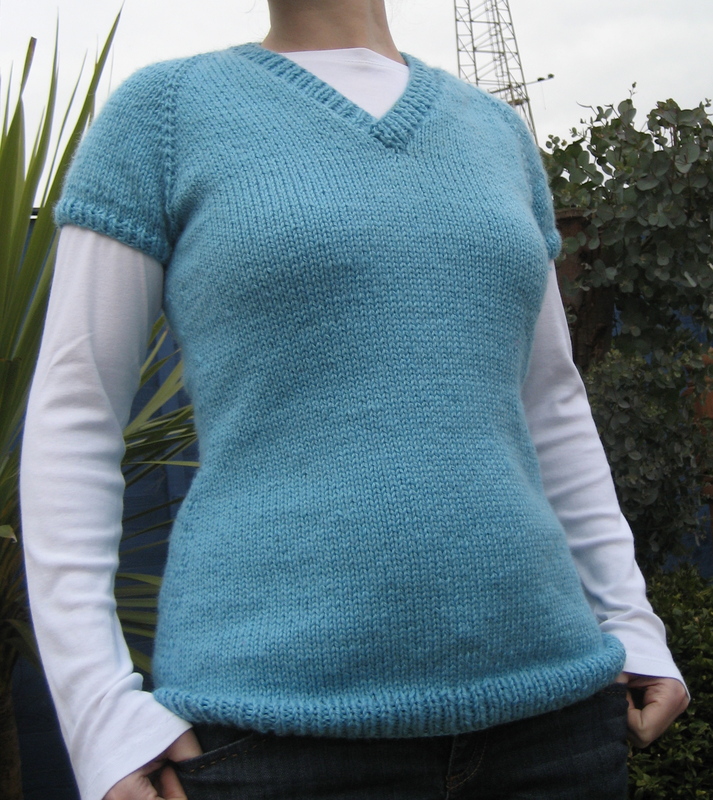 The same with jumpers and cardigans that have miles and miles of stocking stitch, like I should always be proving my knitting abilities by knitting stuff that is complex when actually I enjoy the simple, intuitively constructed garments with simple stitches. I don’t get bored knitting them and wearing them. Nor do I have issue with knitting the same thing twice but somehow I think I’m in danger of being carted off by the knitting police for even thinking of knitting something again. Well today I just thought to heck with it, it’s my knitting I shall knit what I jolly well like! I’m the boss of my knitting. To be fair, no one has ever said I couldn’t love stocking stitch and simple projects, it’s all in my mind. I’m the one that’s stopped myself by worrying what other people will think but in actual fact most people wouldn’t even notice, much less care. 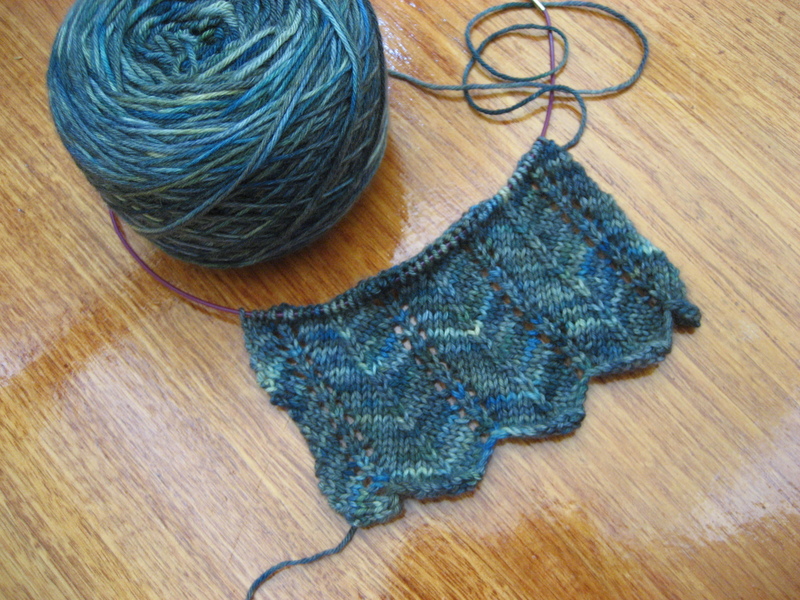 So once my socks are done I’m casting on for another Idlewood. There you go! Not only am I knitting the same jumper twice or should I say thrice seeing as I frogged and re-knit the first one but it is a large top down raglan jumper with acres of stocking stitch and it’s going to make me so happy. 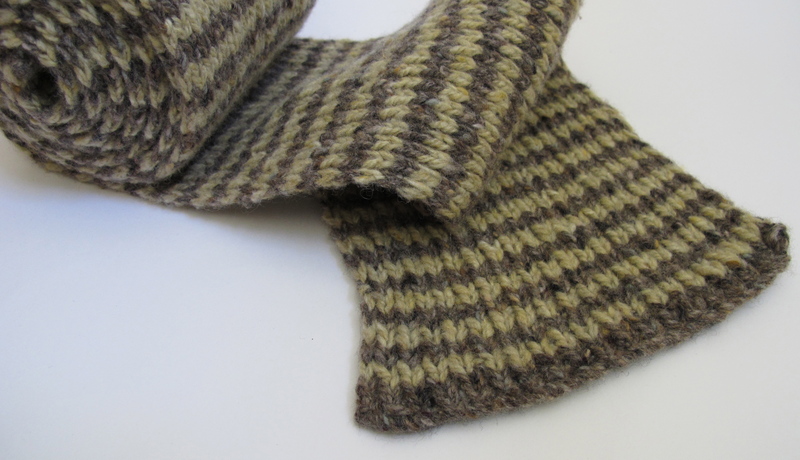 It will have a very different look and feel to the first which is knit in a very rustic Welsh Black yarn, this one will be knit in Sublime Merino cashmere silk aran. 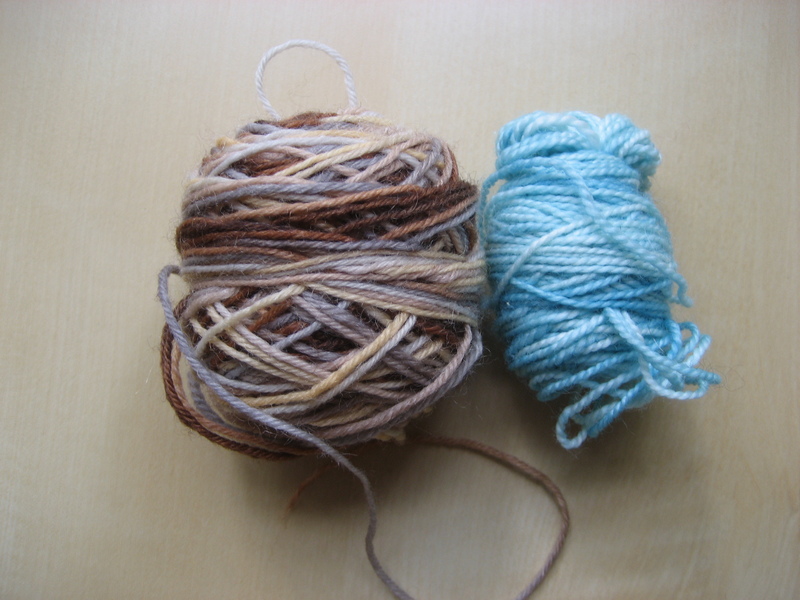 Two more opposite yarns you couldn’t get. 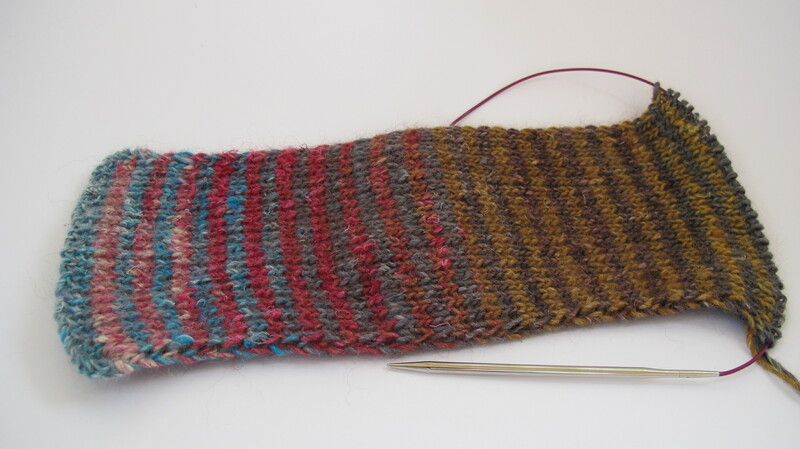 If that wasn’t enough, last week I cast on for a Noro stripy scarf for myself which I’m thoroughly enjoying knitting. The colours, the stripes, the joy! That’s what knittings for. Yay! I get it! Knitting clothes me yes but more to the point it makes me full of happy. I’ve named the scarf Colour me Happy! I think that’s appropriate. Well hello there, how’s your week been? Since we last spoke I’ve become polygamous again. I’m not normally comfortable with polygamous knitting, it tends to overwhelm me with all the WIPs bearing down on me but for many reasons I seem to have not two but three projects on the needles and it’s actually ok.
Then last weekend whilst browsing Ravelry for potential patterns for a handspun birthday gift for my sister I recalled a pattern for handspun fingerless gloves that I had queued previously. 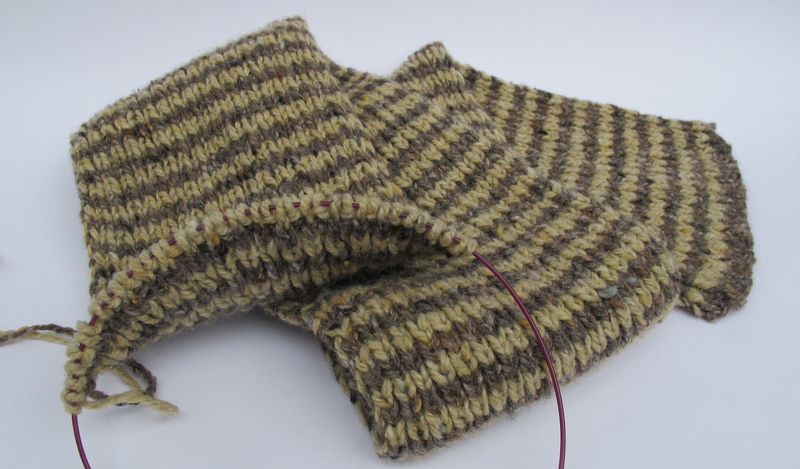 I started wondering whether the mini skeins of Bond 2ply and N-ply combined would be enough to make a pair of mitts. 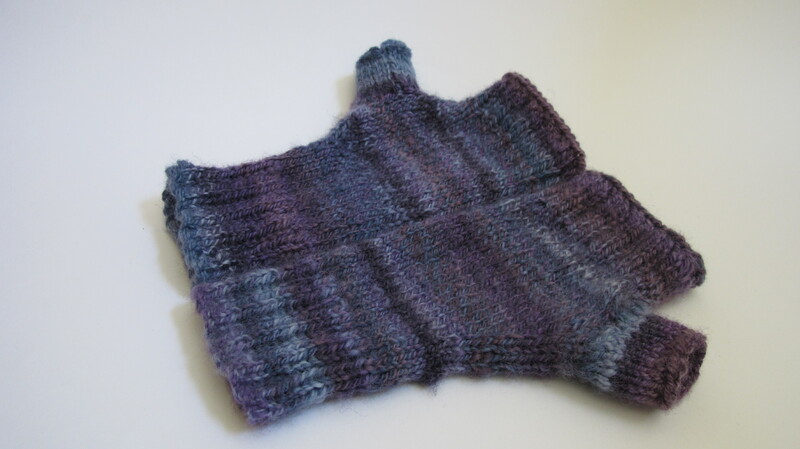 Then before I knew it I’d cast on for one because a pair of mitts takes a day and a half to knit up tops. 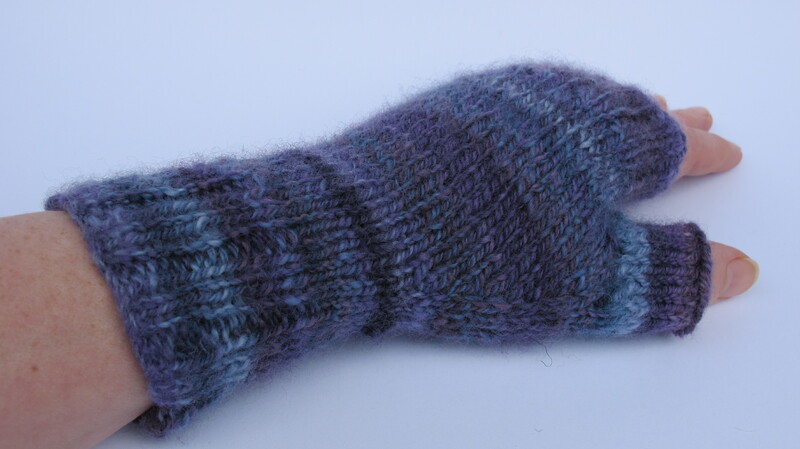 Happily one mitt used just less than half the mini skeins in weight. 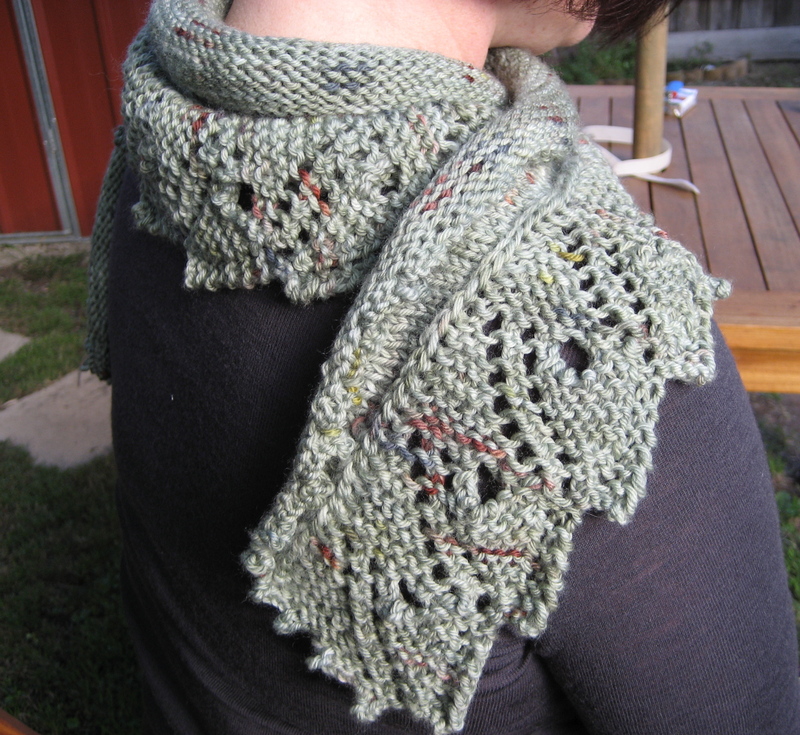 I love knitting with handspun sooo much it’s silly. 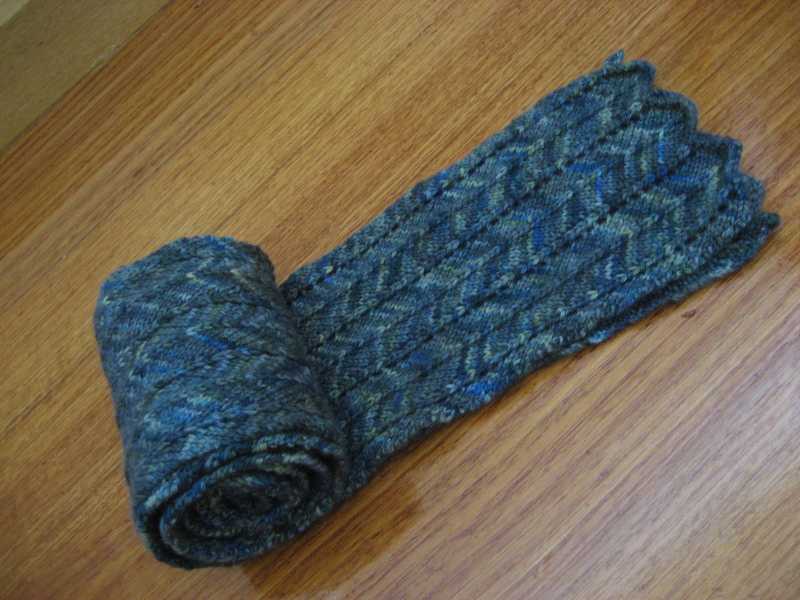 Instead I cast on for Ian’s birthday scarf in a bid to have it knit for the 2nd April which is his birthday. I am all impulsiveness at the moment which is so uncharacteristic but I’m quite enjoying it. 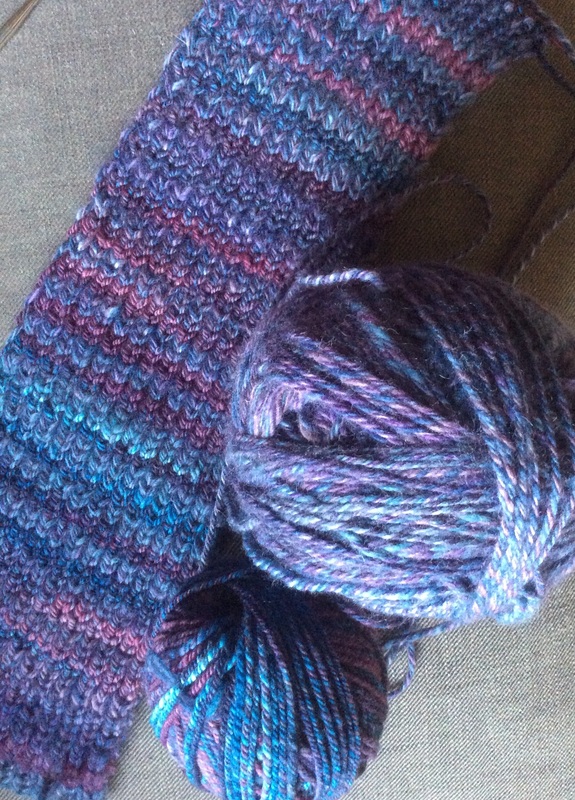 I’m about half way through this scarf now and it’s ticking a number of happy boxes for me. It’s a pleasurable yet mindless knit, it is using up some stash from way back when, there are stripes and Ian loves it (he chose the yarn and the pattern). 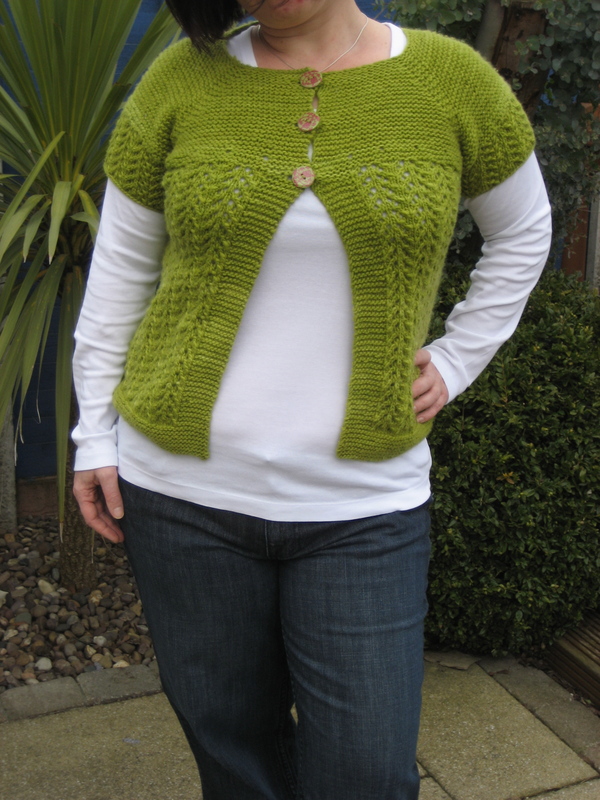 I have decided on a pattern for Fiona’s birthday but only because I saw one of my fellow Richmond knitter’s wearing hers and I knew that it would be perfect instantly. I won’t blog about it though until it’s with it’s owner. Sorry for the belatedness Fi but it had to be right. 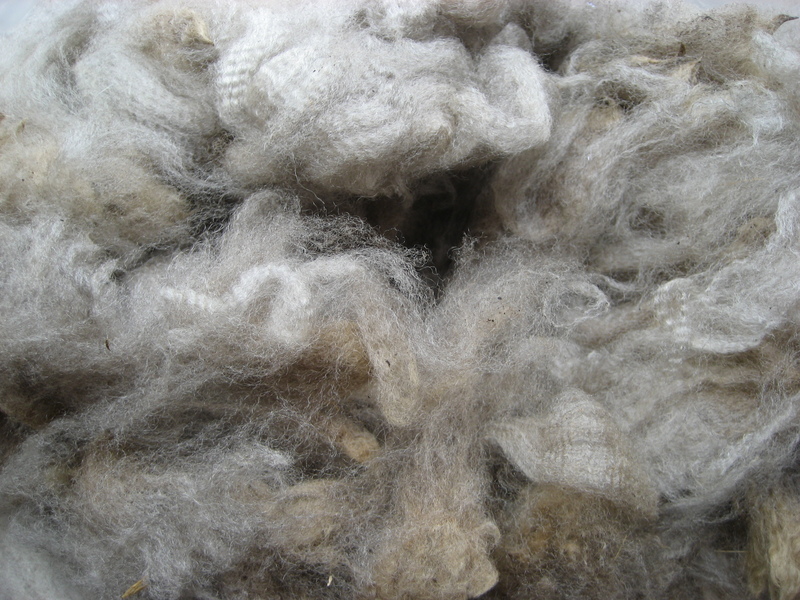 I could wash my Polwarth fleece from Bendigo, I’m thinking of spinning for Seraphine with it maybe. 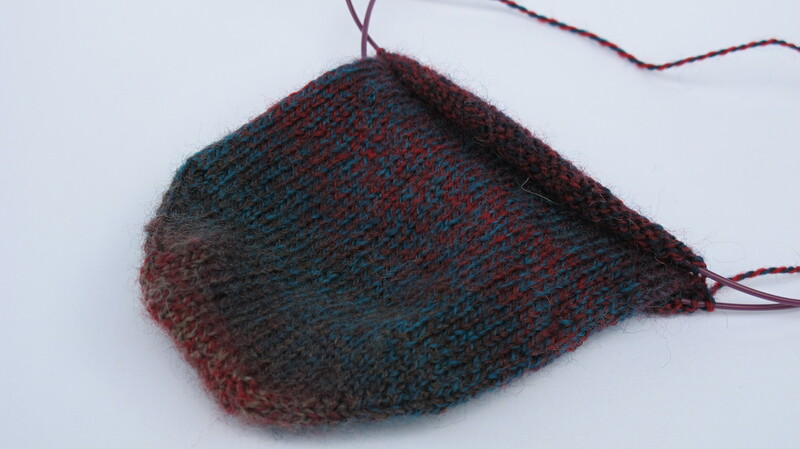 The staples are quite long so it would have to be spun worsted short draw which would make it a bit heavier than if I knit it with a woollen spun yarn. 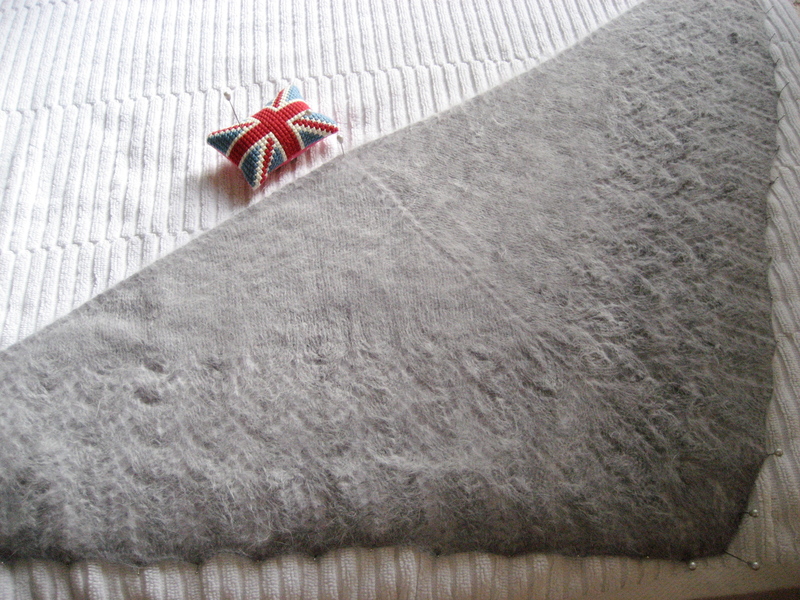 Otherwise it would make a lovely jumper, mmm soft and yummy silver grey. 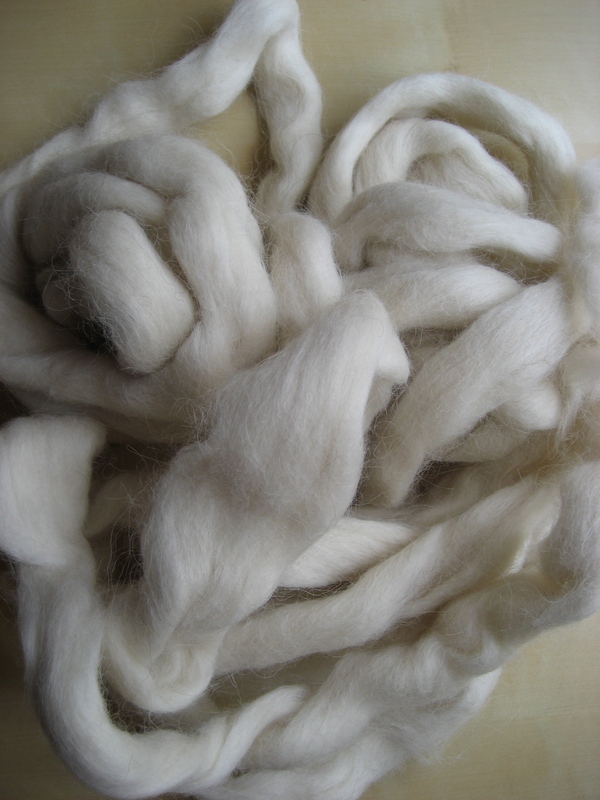 Or I could spin the 200g of icelandic tops I’ve had almost since I started spinning. It’s a bit felted so I hope it drafts ok. I have seriously no idea what I’m going to knit with this so I’m spinning it for the sheer fun of it. Or I could knit a few puffs to add to my collection of precisely 2, the bee keepers quilt may take me a few years at this rate. 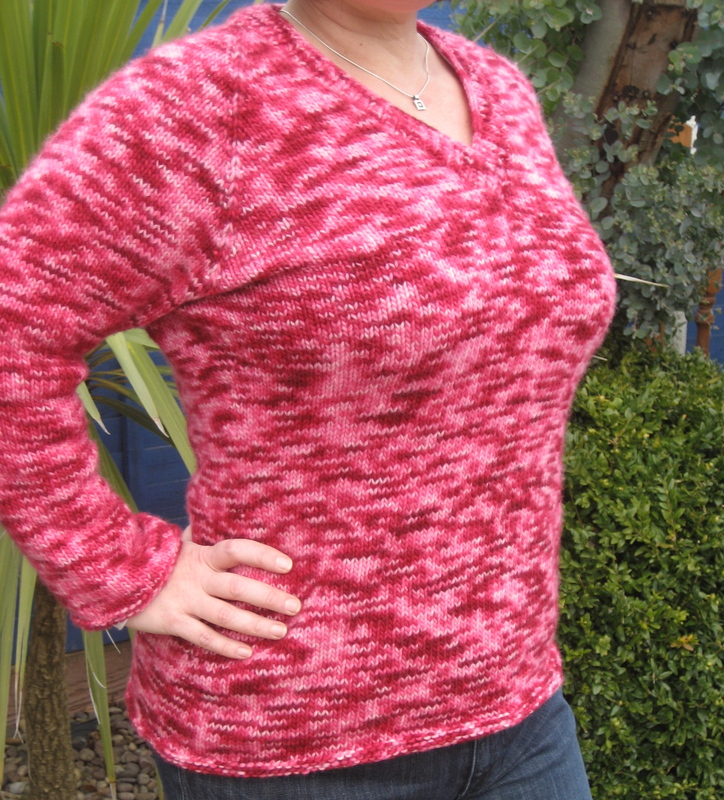 Or I could sit down and start to write the pattern for Sam’s contiguous jumper. Or I could frantically attempt to juggle all of the above because I want it ALL!!! 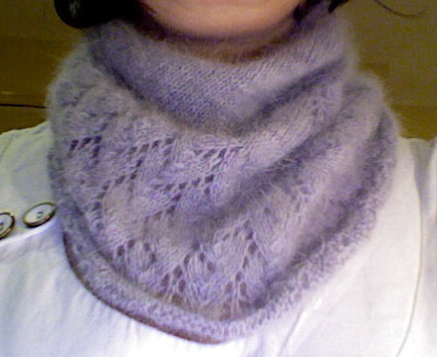 It’s finished and I’m wearing it today and probably every day this week because I love it so much. The yarn hand dyed by Skein is merino/cashmere 4ply in Ao colourway, it is so very soft and squishy and the colours are absolutely gorgeous. It did grow a little after soaking for 5 minutes but I put it in the tumble drier when still a bit damp and it shrunk back to nearly it’s original size. I find that merino does tend to grow a little but 15 minutes in a tumble dryer on a low to medium heat usually sorts that right out. 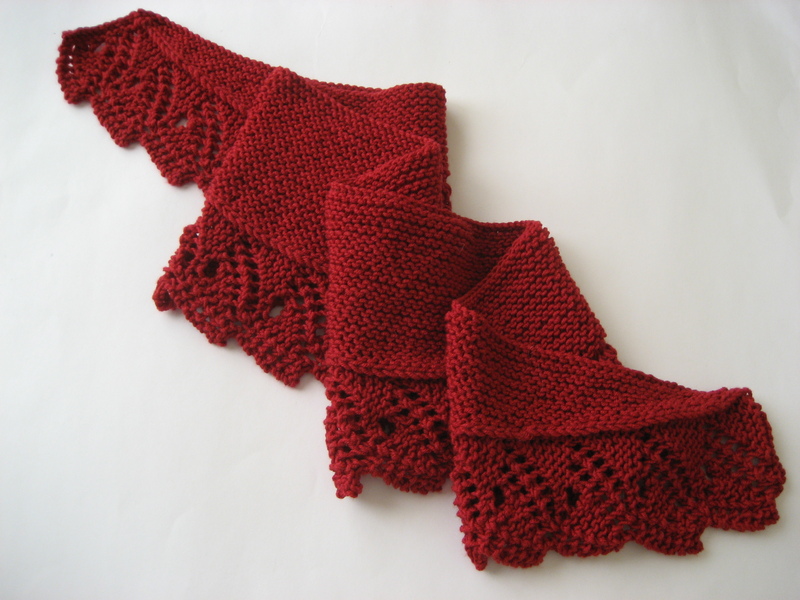 The pattern is “Favorite scarf ever” (oh but it kills me to not be able to put a u in favourite but if you put the u in you won’t find it) by Lisa Bruce. I think it’s a perfect match for pretty sock yarn that is too pretty to end up on your feet and I used my whole skein up to make a long 208cm scarf. The pattern is so easy I would say perfect for someone who wants to try lace for the first time. So now I’m off to work wearing my lovely new scarf… and other clothes of course. As I mentioned in my last post, I’ve cast on for a couple of new projects. One of which is my Aurora Borealis scarf. This scarf combines a few of my favourite things. Firstly, it’s a scarf and I am of the opinion that you can never have too many scarves. 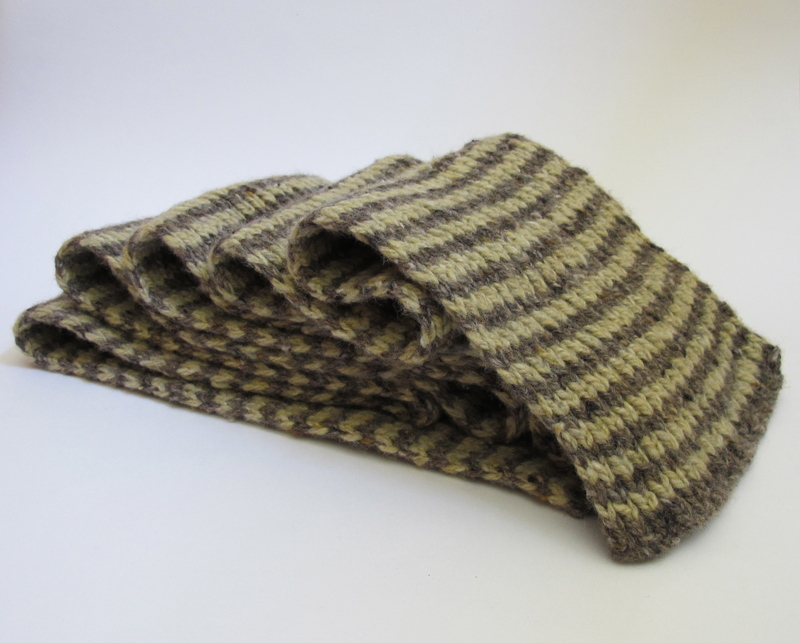 Scarves to snuggle into and scarves that are just enough to take that nip out of the weather. I will even wear a scarf with my pyjamas when I’m watching the telly and of course you need scarves of different colours to complement every outfit. I have big love for scarfie-shawly type things. Secondly, it’s knit from a single skein of luxury sock yarn and I am a bit addicted to buying luxury hand dyed sock yarn. I love the colours, the one-of-a-kind-ness and that they are just enough of a purchase to cheer you up without breaking the bank. The indie dyers that produce these lovelies have my fullest respect and admiration, proper yarn artists they are and I’m more than happy to keep them gainfully employed. Sometimes though, I think that luxury sock yarns are just too beautiful to be hidden under boots and trousers, not that I’m adversed to wearing cashmere socks, oh no! Diamonds may not be my thing but luxury fibres, I can never get enough of and I have every intention of knitting some cashmere socks one day, several pairs in fact. 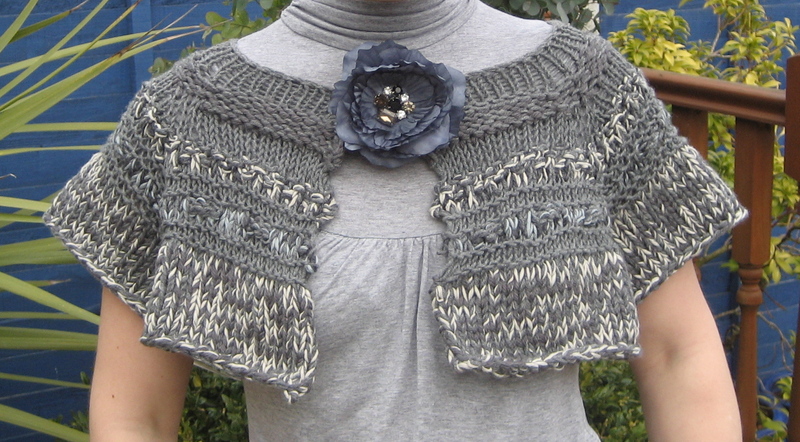 Thirdly, it’s a free Ravelry pattern! 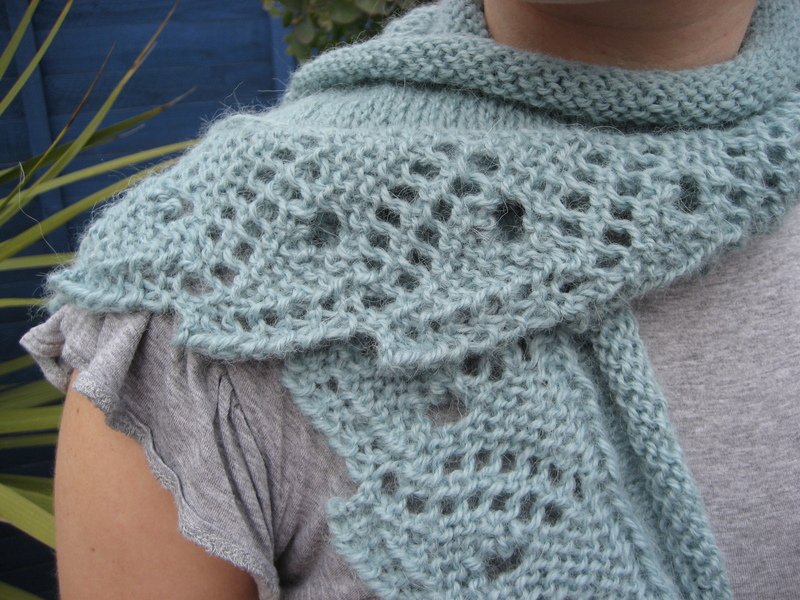 I came across it while playing with the advanced pattern search thingumy which is one of my favourite things about Rav. It is a beginner lace pattern, so very simple, but I like simple and unfussy and it has an elegant chevron thing going on. I like directional stitches too they bring out the colour variations in the sock yarn beautifully. It’s name if you want to look it up is “favorite scarf ever”, which is quite apt really, it’s by Lisa Bruce (I used to have a nana Bruce, she was my nana’s best friend and she would bring lots of Scottish baked treats, yum, for us when she visited, my nana and her both being Scottish). Hmm, anyway, you have to use the American spelling of favourite or it doesn’t come up but here’s a link. As this scarf is knit in two halves it will be small enough to be my on-the-go-knit-it-on-the-peasant-wagon project except that I haven’t yet come to terms with grafting lace since the crofters cowl thing so I might chicken out. Whatever happens, I am so in love with this pattern that I’m planning a second one already, I think that the original one on the Ravelry page has a bit of a Missoni thing going on. The yarn is from Skein a NSW dyer on Etsy, it’s Merino/cashmere in colourway Ao. The colours are grey-green-blue with flashes of light yellow-green, not girly pretty but it will go with many things in my wardrobe. When I began to knit it up the colours moving through the chevrons put me in mind of the Aurora Borealis with the dancing lights and everything so that’s what I called it, yes I’m a bit fanciful now and then often. The Aurora Borealis is something that has long fascinated me and one day I will see it. I read in the news online that they’ve started doing flights from Humberside airport over to the northern most parts of Scotland to view this beautiful phenomena recently, which is very exciting. Next time I come and visit you Fiona we will have to do this! I am aware that there is also the Aurora Australis but the Borealis was the first one I knew about and I’ve been fascinated with it since I was a child so that’s why it takes precedence in my affections. Who knows though, maybe I’ll be lucky enough to get to see both. As you know, I think you can never have too many scarves and one that is knit from a single skein of luxury sock yarn from a free pattern, well, what’s not to love? I’m extremely pleased with it, it is soooo soft and light and warm and the colour is just beautiful with very subtle variations of tone. The yarn is Orkney 100% angora that I bought at baaramewe on my hols and I used just over half a ball for this scarf sized version of Ysolda’s Ishbel and that means I have enough left over for the Ishbel beret, bonus! I like that the yarn is from the Orkney Isles as well, as they are one of my fantasy places to live. One day I hope to holiday there, but for now I fantasize about raising a few sheep, growing some veggies and sitting by a real fire, knitting in an Orkadian cottage, snug as a bug while the wind and rain lash outside. Hmmm. 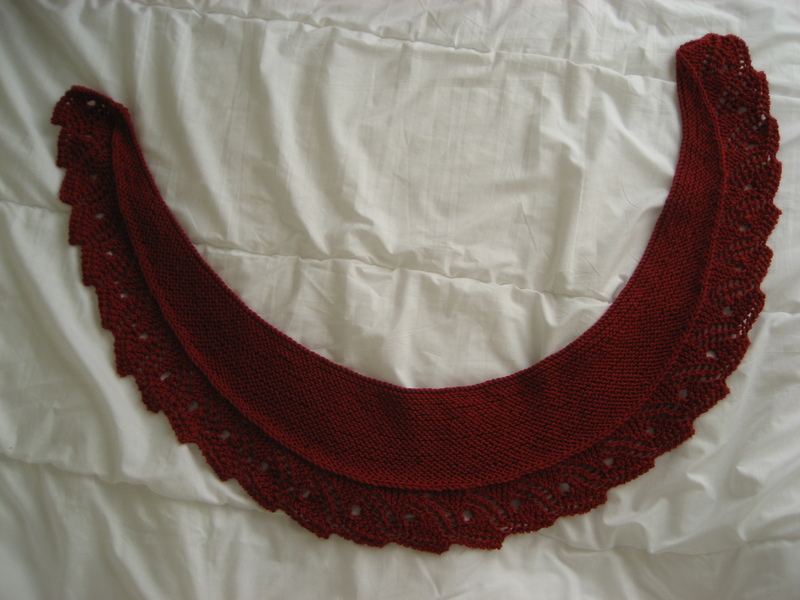 Next to be cast on is Emily, a cape also by Ysolda. Apparently capes are very fashionable at the moment. I think they are very suited to the Autumn weather here in Melbourne, as often you want something to go round the shoulders to keep them warm.